James Madison was the 4th American President who served in office from March 4, 1809 to March 4, 1817. One of the important events during his presidency was the Hartford Convention. Leading Representatives from the Hartford Convention arrived at Washington to present the report containing their resolutions to Congress when the news came of General Andrew Jackson's victory at New Orleans. Then the delayed news of the signing of the Peace Treaty of Ghent arrived, announcing the end of the War of 1812. The news of Jackson's overwhelming victory and the end of the War of 1812 was greeted with jubilation by the nation. 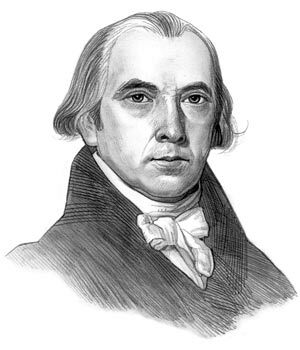 The Republican party of James Madison immediately regained its popularity with the voters. The news sealed the destruction of the Federalist party. The secrecy of the Hartford Convention discredited the Federalists. The very contemplation of secession was seen as too extreme and disloyal. The Federalist delegates of the Hartford Convention found themselves branded "traitors" and the Federalist political party was never able to regain its lost prestige. However, the principle of States Rights, first made at the Hartford Convention, would be repeated in the 1850s, and would ultimately lead to the Civil War. The demise of the Federalist Party was politically significant. The Republicans (aka the Democratic-Republican Party) eventually split into the northern-dominated Republicans and the southern-dominated Democrats and established the political alignment of the 19th century. As there was only one political party this led to are more stable government and heralded the "Era of Good Feelings". The info about the Hartford Convention provides interesting facts and important information about this important event that occured during the presidency of the 4th President of the United States of America. The article on the Hartford Convention provides an overview of one of the Important incidences in his presidential term in office. The following James Madison video will give you additional important facts and dates about the political events experienced by the 4th American President whose presidency spanned from March 4, 1809 to March 4, 1817.